I recently checked out Baked Explorations from the library and immediately honed in on the Cornmeal Griddle Cakes recipe because I’ve been wanting to try them for a long time. I think it took me all of two days to get to it. It was urgent! And I’m so glad I finally got to try some. I don’t know if all cornmeal pancakes are this good, but if so, I was really missing out! Both my husband and I are awfully tempted to call them not just great pancakes but the best. ever. The best pancakes of all types that we’ve ever had. But, alas, we can not. The glorious fluffy buttermilk pancake will always hold the #1 spot, but these are just as good in a different way. First of all, I was surprised by the texture. I expected that the cornmeal would make the cakes dry and more dense. Not so. They were extremely fluffy, moist and light. I don’t get it, but I won’t question it. 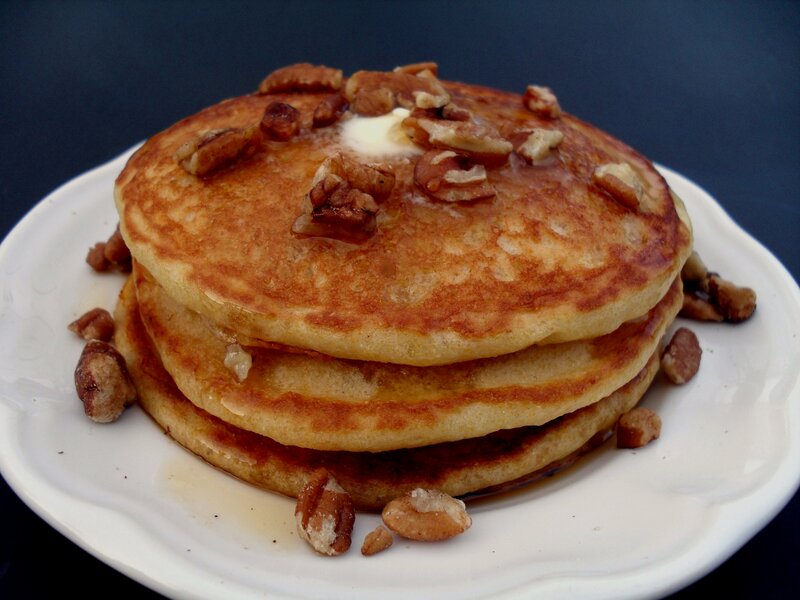 The corn flavor comes through and just tastes so good with butter, maple syrup and pecans on top. Seriously. You must try this! Sift together flour, salt, baking powder, and baking soda in medium bowl. Bring 1 1/2 cups water to a boil. Place cornmeal in a large metal or glass bowl. Stirring continuously, slowly pour the boiling water over the cornmeal. Keep stirring until the mixture has cooled to lukewarm, almost room temperature. Add the brown sugar and stir until combined. Whisk eggs until pale yellow in separate bowl. Add buttermilk and whisk until blended. Add flour mixture, alternating with buttermilk mixture, to the cornmeal in three parts (beginning and ending with the flour mixture), stirring after each addition until just combined. Heat a skillet or griddle pan over medium-low heat. Spray with cooking spray and drop batter in 1/4 cup batches onto skillet. Cook until medium-brown, about 3 minutes, and the tops are bubbly, then flip the griddle cakes over and cook the other side for about 2 minutes and serve immediately. 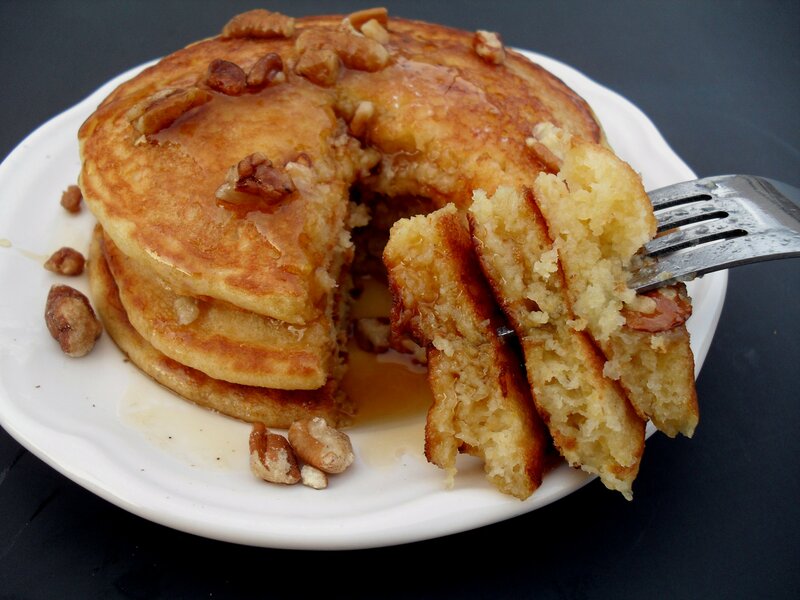 Serve with butter, pecans and maple syrup. 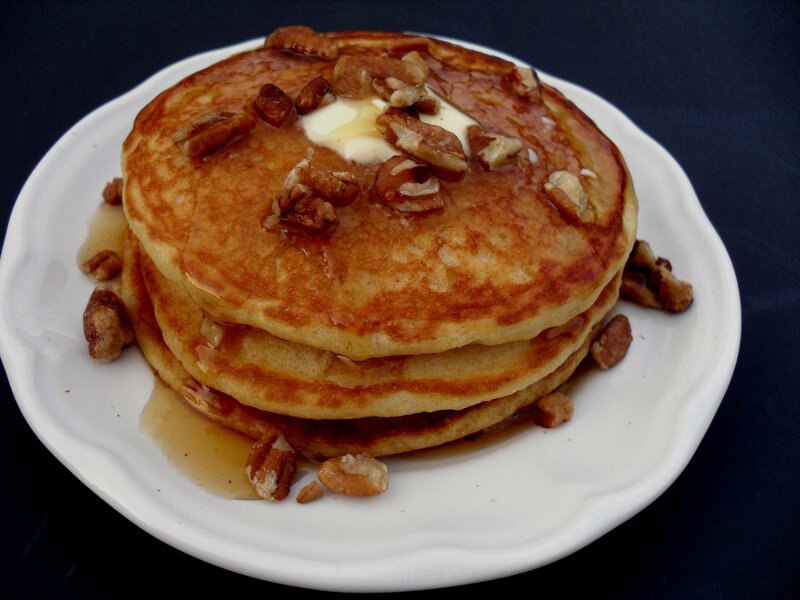 Posted in Breakfast, Lighter Fare, My Favorites and tagged baked bakery, baked explorations, best, Breakfast, butter, cornmeal, cornmeal griddle cakes, maple syrup, pancakes, pecans. Bookmark the permalink. Mmmmm! We love pancakes over here!! I’ll have to add this to the pancake rotation! I absolutely MUST try these! They look amazing. Veronica, these look so DELICIOUS! My mouth is seriously watering! I am definitely making these this weekend. I hope I can get them to be as pretty as yours! I’m a little pancake challenged! These look amazing! 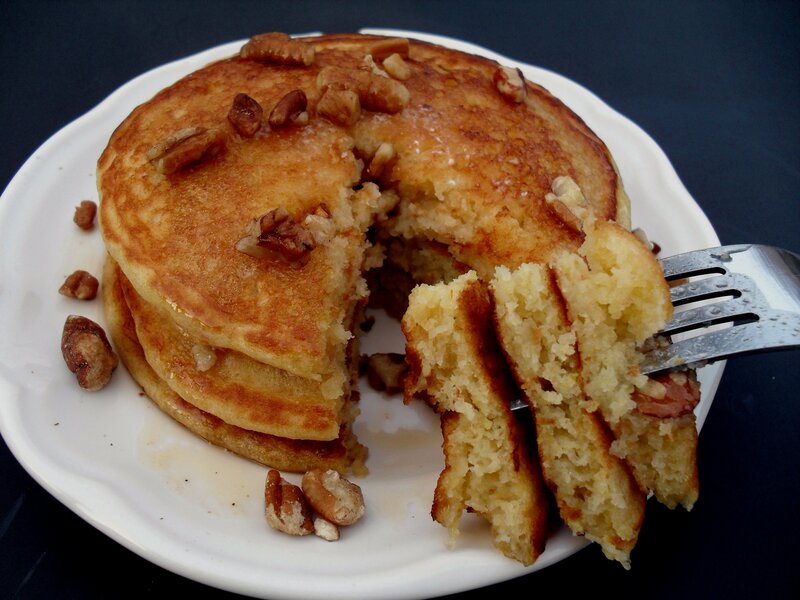 I will be giving these a try soon, as hubby loves pancakes, so I am sure he’ll love them! Kind of reminds me of a hoecake, without all of the fat! I need more time. Hahahaha! I LOVE THESE TOO! I make them with my sourdough starter, super yummy! Love these cornmeal pancakes, Am a big fan of pancakes and this is going to be my next experiment. Lovely space. Yum Yum Yum! Do you deliver? Does anyone know if this recipe can be adapted to use white cornmeal or to use something like Jiffy corn muffin mix. Just wondering because I have lots of both in my pantry! Thanks! You can use white cornmeal but it will not have as strong of a corn flavor as with yellow cornmeal. As for using Jiffy mix, I bet you could just mix it according to the package directions and instead of baking it as bread, make it like pancakes! That’s what I would do. I’m so happy you tried them! I’ll go check out your blog.